Notes: Promo poster for FAC 198. Also refers to Fred & Judy Vermorel's tactical campaign against the BPI (British Phonographic Industry). 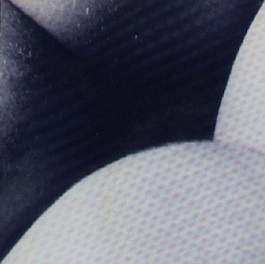 See also how-soon.com [->] for more info on Fred Vermorel's anti-BPI activities. The 20 October 1984 edition of the NME makes reference to FAC 199 being Oliver Wilson (Tony's son). 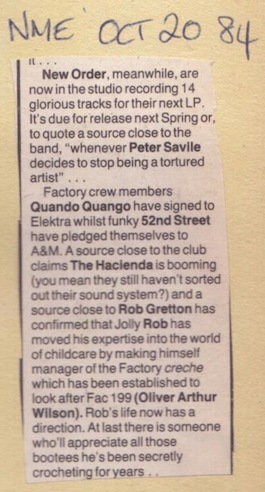 Tacked onto the end of of a short article which also mentions NEW ORDER, QUANDO QUANGO and 52ND STREET, it states "... Jolly Rob (Gretton) has moved his expertise into the world of childcare by making himself manager of the Factory creche which has been established to look after Fac 199 (Oliver Arthur Wilson). Rob's life now has a direction. At last there is someone who'll appreciate all those bootees he's been secretly crocheting for years..."